When we’re tourists we often find ourselves standing on graves or admiring tombs of the illustrious dead. 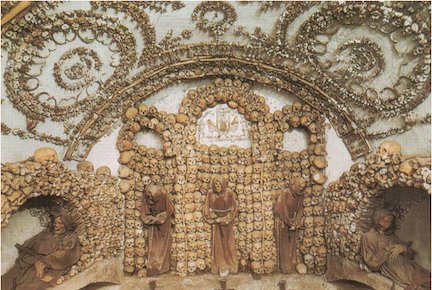 Several years ago, after a traipse through some European cemeteries and catacombs, I became (morbidly) obsessed with the Capuchin ossuary in Rome, a series of underground chapels decorated with the bones of monks in the seventeenth century. Where a tomb designed by Bernini or Michelangelo hides the deceased behind decadently carved marble, the Capuchin monks used actual bones for their headstones, creating decorative patterns in the style of Baroque stucco bas-relief or fresco—swirling aureoles and floral motifs—while other skeletons are collaged into tableaux, such as a clock made from phalanges and flying cherubim composed of skulls and winged shoulder blades. I wanted to learn why the Capuchins built their shrine to death but, oddly, I could not find any full historical accounts about this strange place. I realized that the thousands of tourists who visit the chapels each year are not informed about why this place exists or how it came to be; we are simply left to ogle the lugubrious sculptures and ponder our own mortality. Tourists to the bone chapel can purchase postcards of the crypts so that the visceral images of bodily decomposition may be contemplated in private or distributed around the world like a decree: death trumps art. Today, bone sculptures on a grand scale might inflame the pious rather than exalt them, and our contemporary monuments to tragedy tend toward the minimal and metaphoric: Peter Eisenman’s Memorial to the Murdered Jew of Europe is a field of unadorned blocks, and Maya Lin’s Vietnam Veterans Memorial is a gash of monochrome marble. Two currently exhibited sculptures in Chicago invoke the pleasurable old-timey macabre of the Capuchin bone chapel. Balint Zsako’s “Monument” is an approximately nine-foot tall collage of skeletons in his exhibition at the Loyola University Museum of Art, and Annie Heckman’s “You thought that you were alone but I caught your bullet just in time,” a room-sized installation of stacked drawings of skeletons, is currently configured in the “Physio|tasma|gorical” group exhibition at the Evanston Art Center. Although both sculptures are composed solely of paper, they seek to draw from the power of the original Capuchin bone memorial—a little bit absurd, a lot scary. 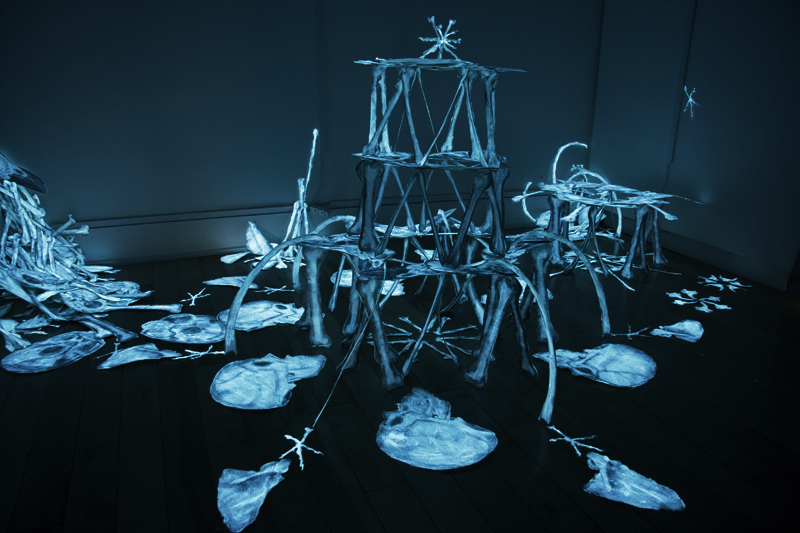 Heckman’s sculpture is coated with glow-in-the-dark paint, which elicits more of an aura of fun than terror. Zsako’s collage has a wonderfully realistic quality, as the bones are sourced from an early nineteenth-century anatomy book. The monument is flanked by cutouts of a man and woman, and because they are tiny in comparison to the bone fragments, they unwittingly make the pile of bones unrelatable to viewers. Will tiny folk tend our bones in the afterlife? Of course, being composed of paper and not bone, Heckman and Zsako’s sculptures do not inspire the horror and revulsion of a real skull removed from its happy home (atop our shoulders, covered in lively flesh), of the Burr Oak/Gacy/Hitler/Capuchin variety. I think the artists are aware of their material limitations, and instead of shock they smartly approach allegory. Heckman’s sculpture is titled “You thought that you were alone but I caught your bullet just in time,” which, although it seems to specify a narrative, alludes to salvation. Someone is saved from a bullet. The religious layer is not explicit, but a larger-than-life saving grace lurks just beneath the surface. Still, the whole sculpture is a house-of-cards made of “bones,” a diversion from the macabre that, like the Capuchin bone chapel, circles art with death, and ultimately sits you back down with death. 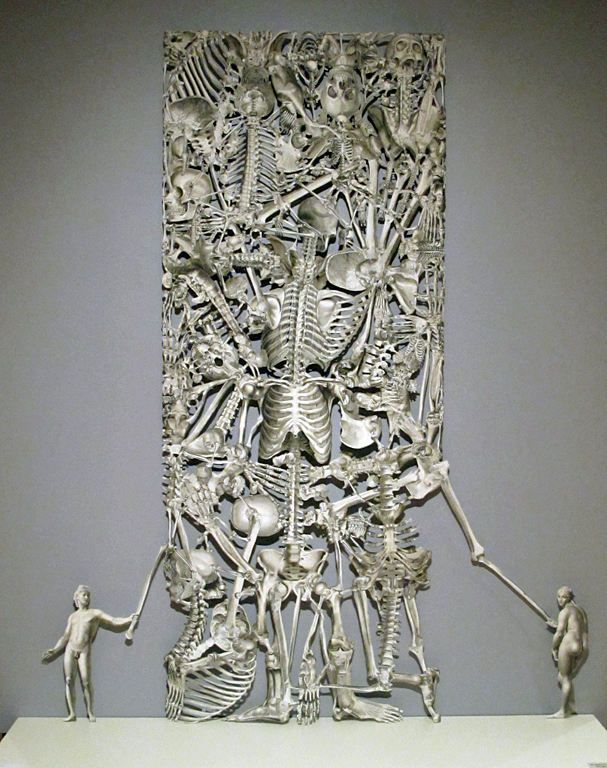 The moral layer of Zsako’s bone tower is also similar to the Capuchins’ bone art allegory: the body may find its way out of the dirt but it will stay on the earth. Heckman’s glow-in-the-dark bones remind me of Tony Tasset’s “Capuchine Chandelier” from 2006, a simulacrum of a chandelier that might appear in the Capuchin crypt, although Tasset’s plastic lamp is fitted with faux-flame electric bulbs for the modern home. In 1773 the Marquis de Sade visited the Capuchin bone chapel and advised in his travelogue that visitors should not visit during the day, for the daylight diminishes the horror; one should visit at night and use candlelight. Even back then the gothic was a horribly campy pleasure.